My Regency Journey: The Destination! 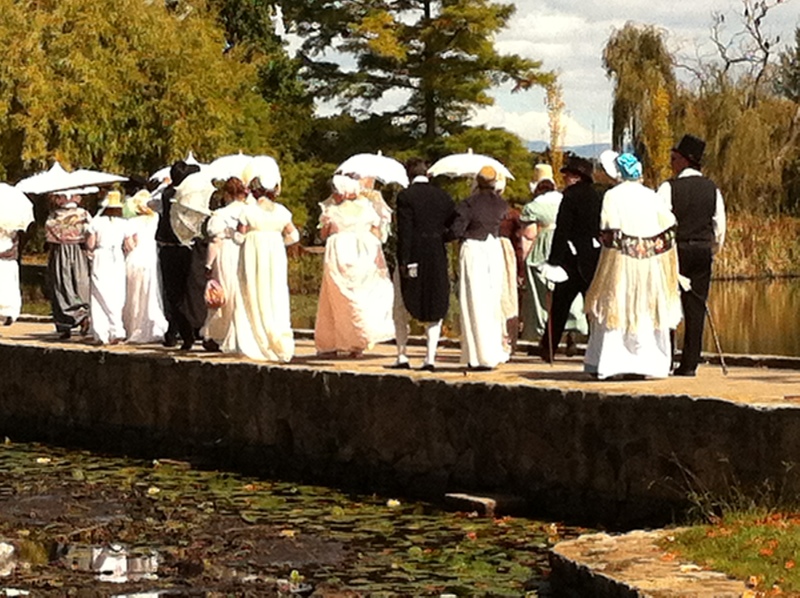 On Thursday April 12th, 2012, I travelled to Canberra for the Jane Austen Festival Australia! The event opened that night with a viewing of Pride and Prejudice (1940) at the National Film and Sound Archive of Australia. It was the first ever film adaptation of Jane Austen’s novels and it was really interesting to see! This movie is black and white, and stars Greer Garson as Elizabeth Bennet and Laurence Oliver as Mr Darcy. It was released a year after the famous Gone With the Wind (1939), which was set in the 1860’s, and I found it reminded me a lot of that movie. Somehow the 1940-era must have crept into both, or maybe the type of acting was just very similar. 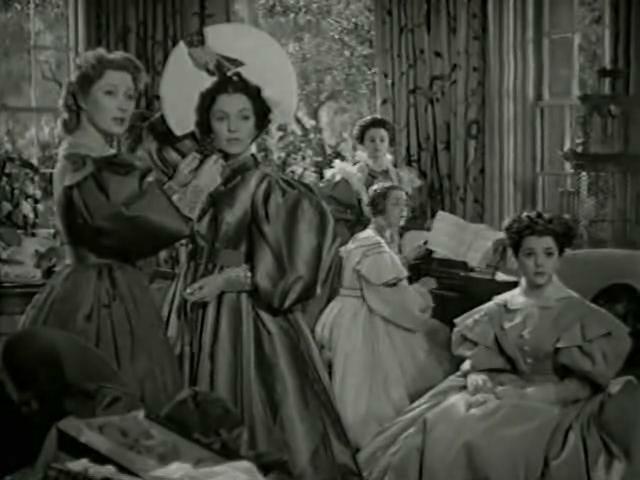 The Bennet sisters: (from left) Lizze, Jane, Kitty, Mary and Lydia. You can see the mutton-chop sleeves from the 1830’s. Unfortunately the side view of the bonnet isn’t seen, as it is a hideously squashed stove-pipe shape! Our gowns all ready to go! The film is known for it’s very early Victorian (rather than Regency) fashions, with its costumes being based on fashions from the 1830’s. The screen writers also altered the plot significantly, which was a little disconcerting, but even so it was fun to watch! The second day began with an early morning to dress and get ready. I wore my morning dress, which was the first dress I had made, with a matching bonnet and reticule. The day was full of dance workshops, sewing workshops and talks given on topics relevant to the Regency era. There was even archery on the lawns! In one of my sewing workshops, I got to handle some REAL 18th and 19th century period clothing, which was VERY exciting! It was fascinating to see the small stitches with which an entire garment was constructed by. It was even more interesting to see 18th century sweat marks and 18th century dirt on the clothes! How cool! In the evening there was a Regency Variety Night, with some “players” (actors) enacting various scenes of Austen’s novels, as well as other funny enactments. There was musical entertainment, including piano playing and opera singing. The opera singer even sung the song Mary Bennet begins to sing in the BBC version of P&P (“My mother bids me bind my hair, with bands of rosy hue…”, called A Pastoral Song)! We had some delicious Regency desserts for supper and finished the night off with some dancing. The other exciting part of the evening was when I was announced the winner of the Regency Serial Competition! Alison Goodman had written 10 chapters of a Regency Serial, called Trust and Tribulation, and she ran a competition for attendees to write the final chapter. Trust and Tribulation can be read online, and so can my winning entry! I woke up feeling a little stiff from dancing until midnight the night before, but hastened to dress for the next day of my Regency Adventure! I wore my embroidered morning negligee, with a matching bonnet and reticule. The third day was again full of dancing, workshops and talks, with the addition of a Olde English Country Fayre. 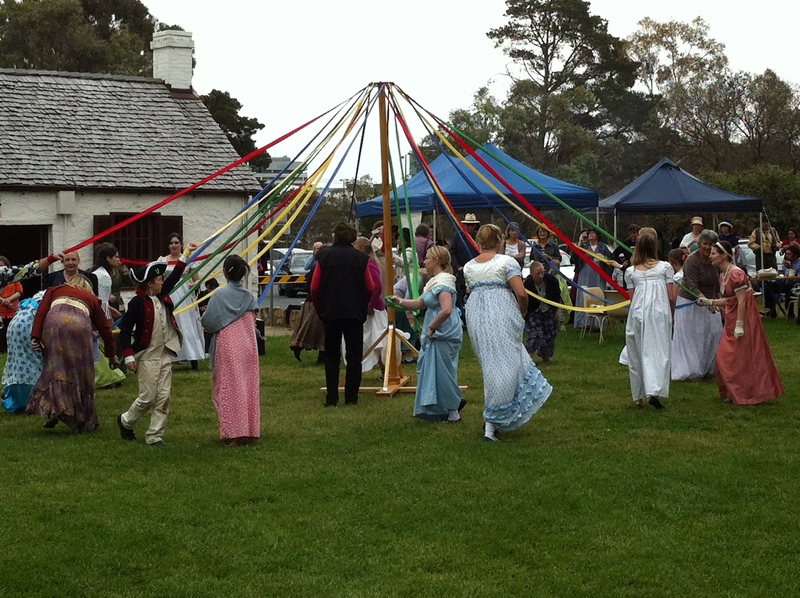 I danced the Maypole, and watched a group of militia fire their rifles (very cool!). 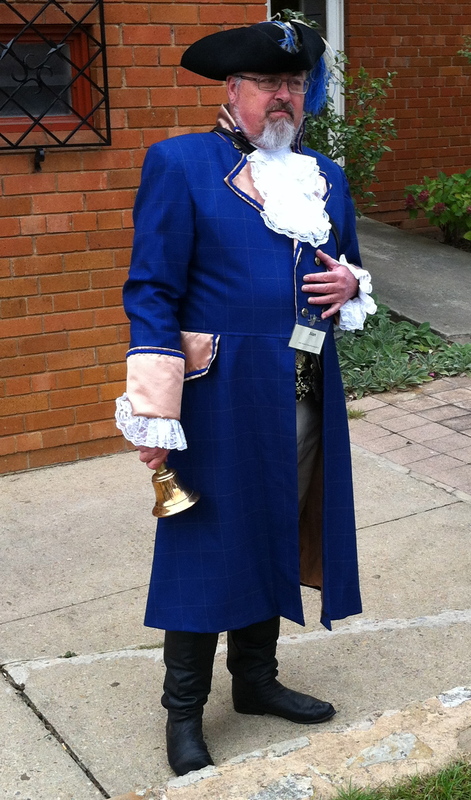 I even met Canberra’s official Town Crier, who walked around all day announcing events in the most appropriate and elegant Regency manner! The Grand Ball was the event of the evening, and we had to dress quickly and style our hair at the hotel in order to be back in time for it. I had forgotten how much I loved dancing, and managed to dance every dance (just like Kitty and Lydia!). I would have loved to get a photo of myself dancing, but I was too busy doing that to think of it! We had a lovely supper, with a hot Regency cordial and a cool Regency lemonade, which were both very refreshing! We got to sleep in a little, but I could hardly walk when I got up! Too much dancing!! I wore my embroidered negligee again, but this time with a pink ribbon around the waist and a chemisette. The morning consisted of a Chess Dance in the park area around Lake Burley Griffin. This dance is danced very similarly to a chess game. There are 32 dancers (16 on each side) and each “chess-piece-dancer” moves about the board in a similar way to their corresponding chess piece. Since I danced the dance, I didn’t take a photo of it, but you can watch last year’s performance. In it you can see the way the “pawns” start by advancing and doing battle and going off the board, and the last “pieces” to finish the set are the king and queen, just like a real game. It was REALLY cool! A Picture of Regency Leisure! The Promenade around Lake Burley Griffin was really very pretty and it was a great time to stroll leisurely and enjoy being stared at! I only wished I had owned a parasol! Thus concludes My Regency Journey, and I look forward to it’s continuation in 2013, especially as I won a free ticket to go next year as part of my Regency Serial prize! Yay! I already am planning my next costume additions, so hopefully there will be more to post soon! 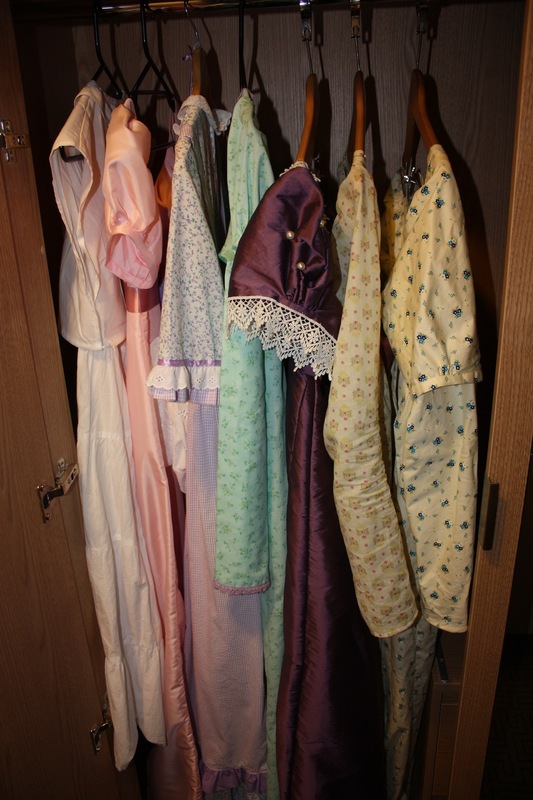 To read back on my Regency costume making, go to My Regency Journey. The Jane Austen Festival was exactly my cup of tea! I Did NaNoWriMo in 2011! National Novel Writing Month: Thirty days and nights of literary abandon! I heard about National Novel Writing Month in September when scrolling through internet sites and I became intrigued. NaNoWriMo (I know; horrible acronym) is a novel writing challenge issued to anyone who wants to join. The Challenge: Write 50,000 words in the 30 days of November! I was amazed at the initial goal! It sounded like such an insurmountable task to write so many words, but as I read more about it I began to feel hopeful that I could achieve such a monumental task. Firstly, when the total word count is divided by the number of days in the month of November, the amount is a mere 1666.6. This amounts to 1667 words a day! That sounded relatively achievable. I wondered how much time it would take to write that amount, so I did a practice session in October. An hour it took me to gush out 1620 words in some semblance of a scene in a story. I was impressed! An hour a day! As I already spend many hours on Facebook every day, I began to think the goal looked even more achievable. I could manage an hour a day. My husband was booked in for heart surgery mid-November, but I didn’t let that stop me! Instead I decided that I might just start early. So I practised some more in October and managed to knock over 6 days of writing (which could always come in handy in case of emergencies)! Secondly, the focus of NaNoWriMo is quantity over quality. Instead of worrying about writing the perfect story, getting stuck, getting discouraged, editing the small amount you have written, and finally giving up, this challenge is about getting the words down on paper. Just getting the words out of your head and onto the page. That’s all. This was a new approach to writing for me. In the past I have tried to sit down and write the perfect story, but the result has always been discouragement because – surprise, surprise – it has not been a perfect story! This time I started with a basic plan of the story I wanted to write. Very, very basic. Each time I got bored I skipped to a different section that interested me. I focused on doing anything that worked, anything that got the words on the page. The month began and it was hard. I carried a notebook around with me to hastily scribble sentences in while I was waiting for appointments, waiting for kids at school, waiting for kids at kinder, waiting for kids at gymnastics, and waiting for a husband at work. I sat down at my computer to write while my baby slept and while my little boys fought over their Transformers. I laid in bed and wrote. I sat outside and wrote. I went to the park and wrote. I sat up late and wrote. I delayed dinner and wrote. I just made time to write. And 50,248 words were all written! What an achievement! They are not WELL written. In fact, I can not even find a paragraph I would want to reproduce here for your perusal! But the time for editing will come. I learnt a lot through this month. A lot from other writers, a lot from authors, a lot about myself! I discovered that there is always a lot to learn when you undertake a challenge. I discovered that stories are written one word at a time. And words can be written anywhere. I learnt that goals can be achievable when broken down into smaller steps. And I also re-discovered how much I like writing! Do you like writing? 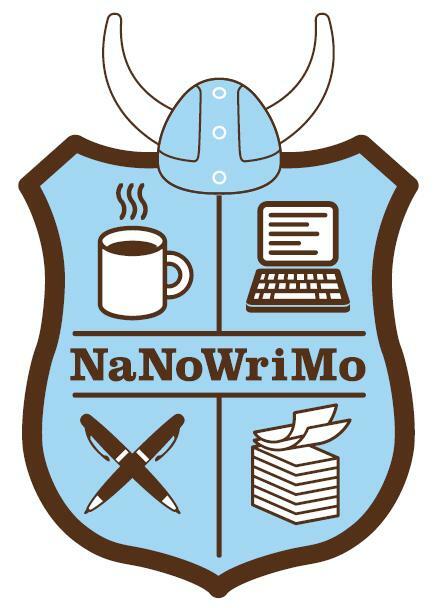 Would you do NaNoWriMo in 2012? Writing is my cup of tea!